In a day and age where we all use our smartphones as the camera that is always with us, we’re all collecting hundreds of megabytes of photos that will eventually need to be taken off those devices and put onto something a little less likely to get lost, like a computer. If you’re the user of an Android phone, then you’re not short of ways to do that. We like using Dropbox as the conduit for getting media from a smartphone to our computers, but if that’s not your particular bag then how about using Google Chrome to manage your media, right from your Android phone? SnapPea Photos is the app that makes such magic possible. 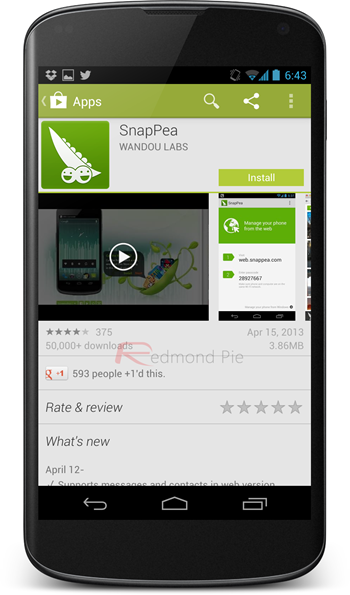 All users need is a copy of the app on their phone, and the SnapPea Photos extension installed in Google Chrome on a computer. Now, the beauty of this method is that you’ll not need a USB cable in order to manage your photos, and that’s great if you’re like us and have tons of cables yet can never lay your hands on one when you really need it! To kick the process off once everything is installed, just launch the app on your phone and you’ll be given a code. This code is what allows Chrome to talk to the Android device in question, so you’ll be needing that! Next up, launch the Chrome extension that you’ve just installed and enter the code offered up by your smartphone. After a little delay you should be presented with thumbnails of all the photos on your phone. Clicking one sees the image which is on your Android device, and from here they can be edited or downloaded to a computer. It’s a two-way process, so images can be uploaded to a phone using the same application, too. Keep in mind that your computer and Android device should be on the same Wi-Fi network in order for this to work. 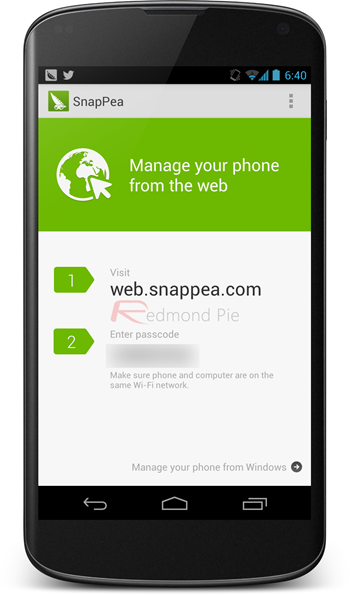 It may not be perfect, and people particularly keen on privacy may still want to look into the process a little more closely, but SnapPea is certainly a viable option for anyone wanting to manage their Android phone’s photos from within Google Chrome. The web version of the whole thing, which lets you access your device by visiting web.snappea.com is also great. Apart from photos, it also lets you manage messages and contacts.